It is 5 pm. Please get on board! 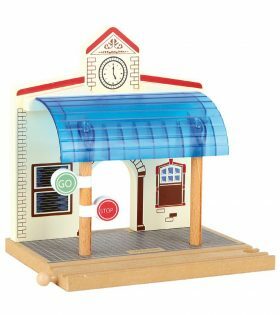 The nostalgic train station gives green light so the journey of the small wooden train may continue. 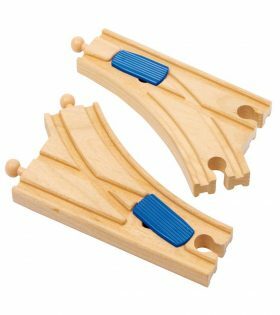 It is a perfect enlargement for the classic wooden railway tracks. Playing fun on both sides and compatible to any wooden railways, this station offers a great play value for little train drivers. 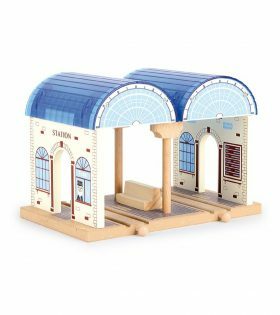 This nostalgic through station is compatible to any element of wooden railway sets and promises a lot of fun. Waiting area with seats, gap warnings and two side exits provide realistic playing. The two round roofs are made of water-resistant plastic. The station is accessible from all sides. 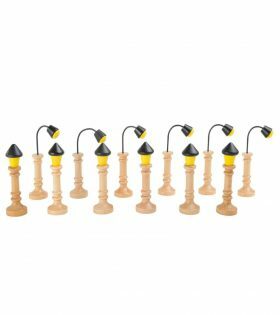 This railway accessory set comprises 12 painted wooden lamps. The lights are available in two versions and round off the range of railway accessories. The wooden lamps are a must in any railway collection. 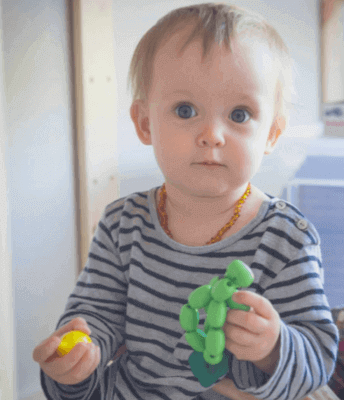 With the fine details they are also ideal for other miniature worlds! A set of 4 railway switches that fit existing wooden railway pieces.